We’d love your help. 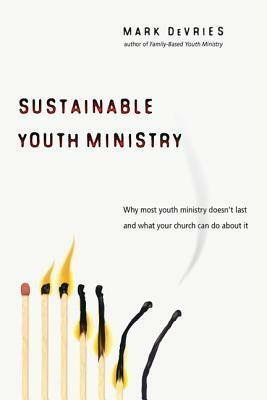 Let us know what’s wrong with this preview of Sustainable Youth Ministry by Mark DeVries. To ask other readers questions about Sustainable Youth Ministry, please sign up. I really liked this. More than I expected. Lots of helpful stuff to think about. Alright, I'm confident in my philosophy of ministry and theology. Now what? This book does a great job at outlining some practical next steps in making your youth ministry effective. My circles have done a pendulum swing when it comes to numbers saying that they don't matter, but they do. We don't want to steal sheep from other churches, but we want the message of the Gospel to touch as many teens as it can. I will be forever grateful for this book. This book is a really good read, not just for youth ministry, but ministry in general. Some very helpful practical advice. A must read for any youth pastor or youth pastor search committee. Following the wisdom of this book can save a decade of failure. The last quarter, save the last chapter, are a bit random, but still filled with great advice. Great advice on building sustainability and healthy leadership for any kind of ministry, not just ministry with youth. Awesome book for anyone involved or connected to youth ministry! "Sustainable youth ministries seek to steward the true Treasure in faithful jars of clay, knowing full well that these vessels of structure and strategy, of leadership and leverage, are only temporary, though necessary, means of bearing the gospel to the next generation." With the average tenure of a Youth Pastor being 4.5 years & the truth that most ministries take nearly 7 years to see change and growth - it is important that we start to analyze ministry and make the proper changes. Sustain "Sustainable youth ministries seek to steward the true Treasure in faithful jars of clay, knowing full well that these vessels of structure and strategy, of leadership and leverage, are only temporary, though necessary, means of bearing the gospel to the next generation." Written with the intent to create sustainable youth ministries, DeVries gives helpful information and useful strategies. His book has caused me to evaluate the ministry I serve and how we can improve. Where the book lacks is the idea of the youth leader as a pastor. DeVries seems to picture the youth leader as a project manager who creates programs. Other than that, I recommend it - solely for the value of reshaping youth ministry. Fantastic book. It's not a theological book, it is purely practical. It assumes a working knowledge of youth ministry, the gospel, and the importance of working with students. The main focus is to help equip a youth leader to create a ministry that is healthy and outlives him or her. It was pretty crucial for me, and helped me change a lot of things about our student ministry. Very helpful book for my role as a youth minister! I would certainly recommend this read to other church workers- particularly those in youth ministry! A book about youth ministry that actually works! Every youth minister should absolutely read this. It will pay immediate dividends. This book was great and I would recommend it for anyone in leadership. Youth ministers and everyone who works with people can benefit from the wisdom in this book. A fabulous primer and go-to for how to do Youth Ministry! For all looking for a realistic and hopeful perspective on structuring ministry, of any kind, this book is an excellent start for long-term Kingdom building. Read for "Family Equipping and Discipleship" class. Lots of good tips for lasting in ministry, even if you're not directly involved with youth ministry. A truly exceptional book on constructing systematic youth ministry. In fact, the principles are so good, that you could apply them in any context of organized discipleship in the church. A must read for anyone involved in youth ministry, from youth pastors, to volunteers, to senior pastors! I am going to end up reading this book again. I was tempted to drop the book after realising it was a book targeted at full-time staff workers, but I think as long as you are a churchgoer who is looking to enter youth ministry to serve or a layleader who is invested in building a sustainable youth ministry - this book will be a super good read. It taught me the importance of rest in good service and the importance of organisational and relational skills motivated by love. It also taught me that t I am going to end up reading this book again. Anyone involved in any capacity with youth ministry should read this book. It delves into why some youth groups succeed and why some fail and most importantly how to help your church develop a sustainable ministry. The book really deserves FIVE stars for its ideas and insights, so why did I give it four? In a lot of ways it is a total downer; it basically states that all youth groups fail and most ministers aren't really qualified to handle the intense work it takes to turn around the culture an Anyone involved in any capacity with youth ministry should read this book. It delves into why some youth groups succeed and why some fail and most importantly how to help your church develop a sustainable ministry. The book really deserves FIVE stars for its ideas and insights, so why did I give it four? In a lot of ways it is a total downer; it basically states that all youth groups fail and most ministers aren't really qualified to handle the intense work it takes to turn around the culture and the direction of the group/church. (Although David didn't sense the same doomsday feel that I did, so judge for yourself.) But we do agree that it acts as a shameless plug for DeVries' organization, Youth Ministry Architects. You're pretty much doomed to fail unless you employ the help of his group. This is the most insightful and practical youth ministry books I've ever read. However, for those looking for a "quick fix" to your youth ministry woes, this is definitely not the book for you. DeVries instead focuses on what's often overlooked by most youth pastors, the systems necessary for long term success. The only drawbacks were the plugs for Youth Ministry Architects, which is DeVries' consulting company. As a business move, it's genius because you get people seeking your help, but from t This is the most insightful and practical youth ministry books I've ever read. However, for those looking for a "quick fix" to your youth ministry woes, this is definitely not the book for you. DeVries instead focuses on what's often overlooked by most youth pastors, the systems necessary for long term success. The only drawbacks were the plugs for Youth Ministry Architects, which is DeVries' consulting company. As a business move, it's genius because you get people seeking your help, but from the literary perspective it's lacking. There were often times where he wouldn't elaborate on practical steps forward, but would direct the reader to their website. No matter the drawbacks, this would be the number one resource I would recommend to youth pastors. This is not written by an academic in ivory towers, but written by a practitioner for practitioners. The insights gleaned from reading this book will pay dividends for years to come in my youth ministry. This book simultaneously challenges and affirms those called to youth ministry. The affirmations are plenty (which is so necessary for those who are called to this for the long haul), and the challenges aren't so much convicting as practical. My husband is the youth minister, not me, though I am involved in his ministry wholeheartedly as a volunteer and at-home cheerleader. It was so validating seeing how my husband is not the only one who goes through what he deals with. And it has given me ins This book simultaneously challenges and affirms those called to youth ministry. The affirmations are plenty (which is so necessary for those who are called to this for the long haul), and the challenges aren't so much convicting as practical. My husband is the youth minister, not me, though I am involved in his ministry wholeheartedly as a volunteer and at-home cheerleader. It was so validating seeing how my husband is not the only one who goes through what he deals with. And it has given me insight in how I can support him better. He is already putting various techniques from this book into practice. That is awesome. But I am so grateful for a common vocabulary for his job that we can use - and share with others. I am inspired and energized by reading this - and increasingly fascinated with the machinations of most church leadership "systems". This is honestly one of the most practical books relating to youth ministry I've read. I intend to keep it close by for reference as I work to steps outlined in this book. I appreciate that the author is clear that there is not one exact model that brings success, but rather a process that can fit the needs of your particular ministry. It was quite a reality check to accept that there's no such thing as "the absolute perfect youth pastor," but rather a system that needs to be in place to ensure This is honestly one of the most practical books relating to youth ministry I've read. I intend to keep it close by for reference as I work to steps outlined in this book. I appreciate that the author is clear that there is not one exact model that brings success, but rather a process that can fit the needs of your particular ministry. It was quite a reality check to accept that there's no such thing as "the absolute perfect youth pastor," but rather a system that needs to be in place to ensure success for whoever is brought in to fill those shoes. In 2008, Mark DeVries wrote one of the best youth ministry books available in the field, Sustainable Youth Ministry. This book influenced churches all over the country with a sound theology and understanding of the workings of youth ministry. The practical tools and insights that DeVries provided have increased the effectiveness of many local church youth ministries. Sustainable Youth Ministry is a must read for every youth minister and pastor, and I highly recommend the book to help train parent In 2008, Mark DeVries wrote one of the best youth ministry books available in the field, Sustainable Youth Ministry. This book influenced churches all over the country with a sound theology and understanding of the workings of youth ministry. The practical tools and insights that DeVries provided have increased the effectiveness of many local church youth ministries. Sustainable Youth Ministry is a must read for every youth minister and pastor, and I highly recommend the book to help train parents, ministry leaders, and volunteers in the local church. I am very excited for the impact that this book has had and will have on youth ministry. 1. The anatomy of stuckness that keeps churches mired in ineffective youth ministry. 2. A new way of thinking about youth ministry; paying attention to systems, structure, and climate. 3. Building a sustainable team. This book could easily been titled, "Sustainable Ministry", "Sustainable Home", "Sustainable Schools", "Sustainable Life", "Sustainable ______________." The point the author makes is in order to sustain anything worth while, you must have systems in place to do so. He talked about "Crisis of Capacity" where you can only grow to the capacity that has already been built in. He then begins to give steps on how you can increase the capacity of your organization. This is a great read for ANYONE in le This book could easily been titled, "Sustainable Ministry", "Sustainable Home", "Sustainable Schools", "Sustainable Life", "Sustainable ______________." The point the author makes is in order to sustain anything worth while, you must have systems in place to do so. This is the best youth ministry book there is. Period. Youth ministry has historically been unsustainable. Youth minister comes in, does good, but when he leaves, the ministry falls apart and the next person must start from scratch. This is cyclical in many churches, but what DeVrie has done is examine some of the traditional pitfalls of unsustainable youth ministry practices, and then show us ways to make youth ministry work.